Often, the topic of foreign fighters is looked at from a (limited) counter-terrorism perspective only. In those cases, the object is not foreign fighters as such, but foreign terrorist fighters. This term has been defined in several ways, but the most authoritative one can be found in UN Security Council Resolution 2178 of September 2014, which refers to “individuals who travel to a State other than their States of residence or nationality for the purpose of the perpetration, planning, or preparation of, or participation in, terrorist acts or the providing or receiving of terrorist training, including in connection with armed conflict”. Conversely, this Tab will collect cases of (individuals related to) (potential) foreign fighters as such, whether the suspects are charged with terrorism-related crimes (which admittedly will often be the case), war crimes or any other crimes. Through the analysis of these cases, policy makers, practitioners and scholars alike will get a better insight into how (individuals related to) (potential) foreign fighters are prosecuted and which lessons learned can be distilled from these prosecutions. These lessons will be incorporated in papers that will be placed on both the ICCT website and this ICD Foreign Fighters Tab. The Foreign Fighters Tab has just been launched and hence the number of cases is still limited. However, more cases will be uploaded in the future. Though the ICD is managed by a competent team of editors and interns, and already contains, in addition to several videos and working papers, more than 700 cases, any help would be greatly appreciated. We kindly request that you send suggestions for the database, information regarding important cases from any jurisdiction (not necessarily related foreign fighters), and particularly original court documents to the editors: editors@internationalcrimesdatabase.org. Thank you very much in advance for your assistance in continuing to build a comprehensive and user-friendly ICD together. On 26 August 2016, the Larmond brothers and Suliman Mohamed pleaded guilty to terrorist offences related to the Islamic State and Syria. They had planned to travel to Syria to join the Islamic State and had attempted this travel on several occasions. One of the twin brothers, Ashton Larmond, was the group’s leader and had previously had his passport revoked prior to heading to Syria via Turkey. His twin brother, Carlos Larmond, was arrested at the airport on his way to Syria, via India. Suliman Mohamed had planned to travel to Syria but had not been able to obtain a passport. In their sentencing remarks, Judge McKinnon compared home grown terrorists, such as the defendants, to “a particularly virulent form of cancer that must be aggressively eradicated”. Ashton was sentenced to 17 years’ imprisonment, and Carlos and Suliman were both sentenced to 7 years’ imprisonment. The case involved a 21-year-old man of German nationality with Iranian roots. He became a radicalised individual of Salafist Islam while living in Germany and eventually decided to travel to Syria. During his time, there were three photographs taken of him posing with the severed heads of enemy combatants impaled on metal rods, together with another man, known to be involved with jihadists groups in Syria. After his return to Germany, these photos were uploaded by Vedat V. onto a Facebook page, with limited privacy settings. Additionally the accused had stored these photos on a computer belonging to the sister of a deceased foreign fighter and on his mother’s phone. The accused was arrested and charged with war crimes under the German International Criminal Code, for gravely humiliating and degrading treatment of protected persons, in this instance the bodies of deceased soldiers. The trophy like treatment of the severed heads and knowledge of the fact that viewing such photos would horrify and shock a reasonable person demonstrated the intent of the accused to mock the dead. He was sentenced to two years’ imprisonment for war crimes consisting of the degrading and humiliating treatment of protected persons. On 1 December 2014 Ms. Shukri F., a young Dutch woman, was acquitted on two charges by the District Court of The Hague. She was charged with 1) recruiting people to join the armed struggle in Syria, and; 2) incitement to commit terrorist crimes and dissemination of and collecting inciting material. Although the Court acquitted her, the Prosecutor appealed. The defendant was allegedly active in spreading the virtues of Islamic orthodoxy in multiple ways. First, she used social media and gave lectures about Islam. Second, she encouraged multiple women (some underage) to marry and to depart to Syria. Third, she married a man who she supported in his wish to go to Syria. After he had left for Syria she divorced him and married another man, Maher H., who she also encouraged to depart to Syria. The Court of Appeal ruled that it could not establish that the defendant recruited people to join the armed struggle in Syria. It could establish, however, that 2 videos she had posted on Twitter amounted to the dissemination of inciting materials. For that reason she was sentenced to a suspended imprisonment term of 6 months and a probation period of 2 years. Maher H. : Prosecutor v. Maher H.
Following his initial conviction in December 2014, Maher H., the first convicted returning Dutch ‘foreign fighter’, was convicted again on 7 July 2016 and sentenced to four years’ imprisonment by the Court of Appeal in The Hague. Maher H., who the Court determined supported the jihad, had travelled to Syria in 2013, where he participated in the armed conflict. The Court found him guilty of: preparing to commit terrorist crimes, including murder and manslaughter; training for terrorism; and disseminating inciting materials, including via sharing videos, documents and posting a photo on social media. 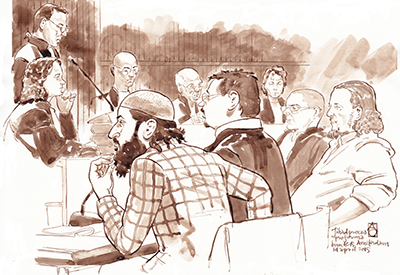 In contrast to his initial verdict, Maher H was found guilty of training for terrorism as he had, inter alia, acquired outdoor wear, searched the internet for information about the jihad and participated in the armed conflict. The Court of Appeal did find that these acts had a strong enough link to terrorist training. In contrast to the District Court’s judgment, it did not address the fact that this criminalisation could also potentially lead to the acts that constitute preparing to commit murder and/or manslaughter being punished twice. Similarly, the Court of Appeal disagreed with the District Court as it held that the uploading of pictures of jihadi flags did not constitute a direct or indirect call to commit terrorist crimes.